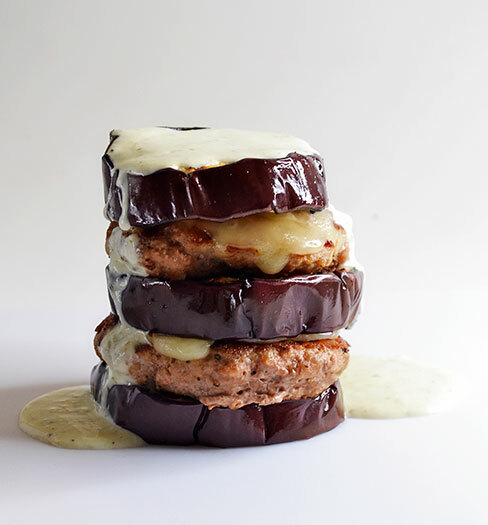 Behind the Bites: The Double Turkey Burger Eggplant Stack! This low-carb mountain consists of sliced eggplant and ground turkey patties - grilled, stacked and drizzled with my favorite homemade sauce - which for me, in this case, is Sweet Pickle Ranch sauce. After preparing this breadless-manwhich I realized this could be a featured item at a low-carb Carl's Jr. The only thing missing was a beautiful vixen luring men ages 17 to 34 to buy it. This is my first attempt at using eggplant in my own kitchen. I have eaten it several times and enjoyed it, but never sought to make it part of a my own recipe collection. I am really pleased with how the eggplant turned out and I am looking forward to experimenting more with it. I started out thinking the eggplant would work like bread slices and allow me to handle the stack, but cooking it correctly left it too soft to handle and it needed to be eaten with a fork and knife, which was the only thing that slowed this mound of savory yum from entering my belly in record time. I'm going to refine this for sure - I just thought it was worth sharing. If you have any great grilled eggplant recipes please send them my way! Heat grill to medium high. Brush eggplant with olive oil and season to taste. Grill 3 to 4 minutes per side or until cooked through and soft, remove let rest. Grill turkey patties 8 minutes or until cooked through, turning once during cooking. After turn, add cheese to patties and let melt. Remove and rest, 5 minutes. On a plate stack eggplant and burgers, drizzle with favorite burger sauce or dressing, then serve.